Another birthday, another birthday cake. This year the girls wanted a blue cake with pink frosting and the closest I could get was a blueberry velvet cake with strawberry cream cheese frosting. I only had one mess-up, too. I'll show it to you momentarily. This recipe originally comes from I Heart Chocolate Milk, who apparently got it from that big, and I mean HUGE, book, Joy of Baking. Ever seen one? My mom had one. Wow. But before I get to that, let me just tell you a bit about how this went down at my house. First of all, the kids were supposed to help me, but they couldn't get along for more than 24 seconds at a time, so that idea was basically nixed. 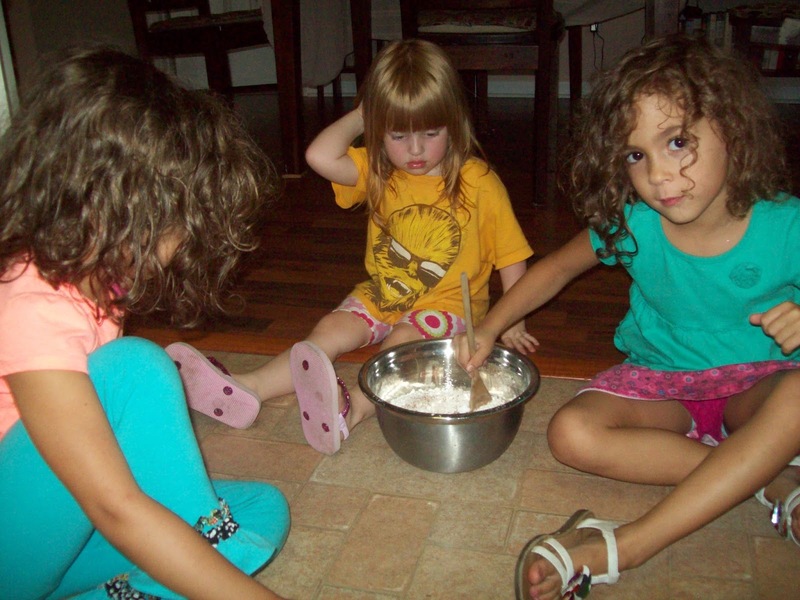 They did help measure the dry ingredients, though. My friend Leanna was over with her young daughter when I started reading the directions. Right away a snag. This recipe made two 9" round cakes to be piled atop each other, and I wanted a sheet cake. We tried unsuccessfully to do the math for a half-second before giving up. She called her sister, who is apparently a goddess in the kitchen, to ask if a recipe that made two round 9" cakes would also make one 9" x 13" cake. Then we got to this gem of a step: "Grease 2 9″ cake pans with butter or cooking spray. Line with parchment paper, then grease again. Set aside." Are you kidding me? What does that even mean? I completely do not understand this step. Like I'm reading it, and not comprehending what it is they could possibly be asking me to do. I don't get it. I grease the pans with butter. Then I line with parchment paper? Parchment paper is square. Pans are round. Do I fold it over on itself? Parchment paper is a bit springy. It's not going to stay in those shallow pans? Should I tape it down? Fold it over on itself? Wouldn't the cake come out...crinkled in that case? And then, then, I have to grease the paper after putting it in? After I just greased the pans? Leanna's sister told us to skip that part and just use crisco and flour. Which I gratefully did. Because seriously. What is that up there? By the way, when Yasmin showed up to save the day (and she really did), she decided this was totally inadequate and re-grease and re-floured these pans. But I'm not complaining, because whatever she did allowed me to get those cakes out of there with more ease than I've ever experienced. Okay, so now we do all the dry ingredients with no problem. 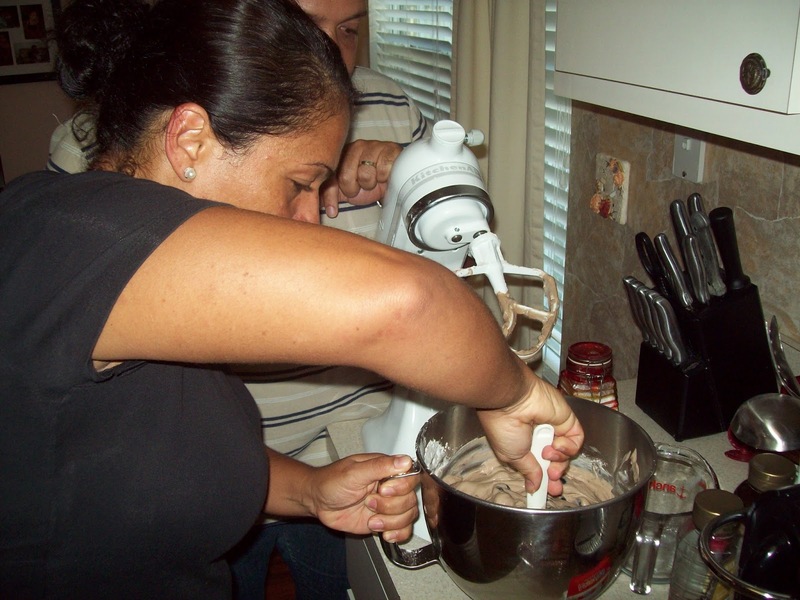 Then I get to this step: "Slowly add the sugar, and cream (beat with the mixer) until light and fluffy, about 3 minutes." This looks to me like Add the sugar and cream and beat it with the mixer. I had to toss it out and try again because what the directions said really was cream together the sugar and butter. Thankfully, this was the point Yasmin and her whole home-cooking family showed up, and I opened the door with, "Oh my God, I need your help" while Leanna laughed in the background. It was a pretty amazing day, not going to lie. 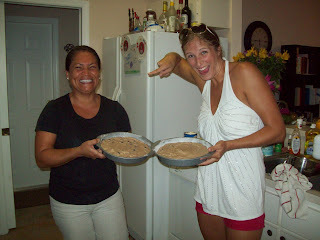 Smooth sailing from here on out, so here are a few pictures before we get to the delicious recipe. Anyway, they left and I took the cake out of the oven and frosted it, and voila! Delicious, delicious cake! 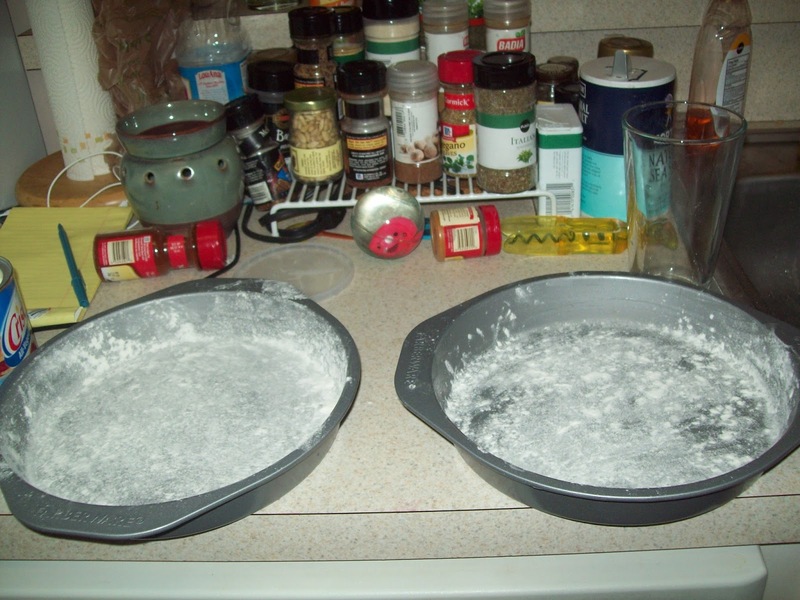 Grease 2 9″ cake pans with butter or cooking spray. Line with parchment paper, then grease again. Set aside. In a bowl, combine flour, cocoa, baking powder and salt. In another bowl, using a hand mixer, beat the butter until light and creamy, about a minute or so. Slowly add the sugar, and cream (beat with the mixer) until light and fluffy, about 3 minutes. Add the eggs one at a time, being sure to fully incorporate each egg before adding the next. Add the vanilla, and fully incorporate. Add the blue food coloring as you like. I just add some, mix it, and then see if I need to add more. 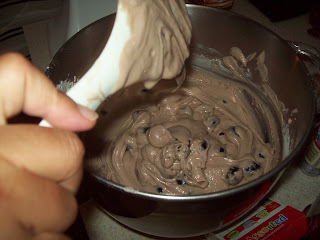 Keep in mind that we still need to add the flour and milk, so color it a little darker than you want it in the end. It will lighten up once we add the remaining ingredients. 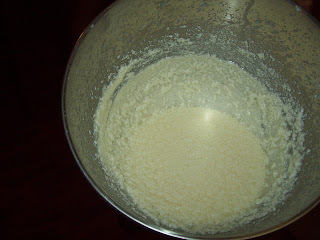 Add the flour mixture in 3 parts, alternating with the addition of milk. So you’ll add flour, then milk, then flour, then milk, then flour last. Make sure to incorporate each before adding the next. 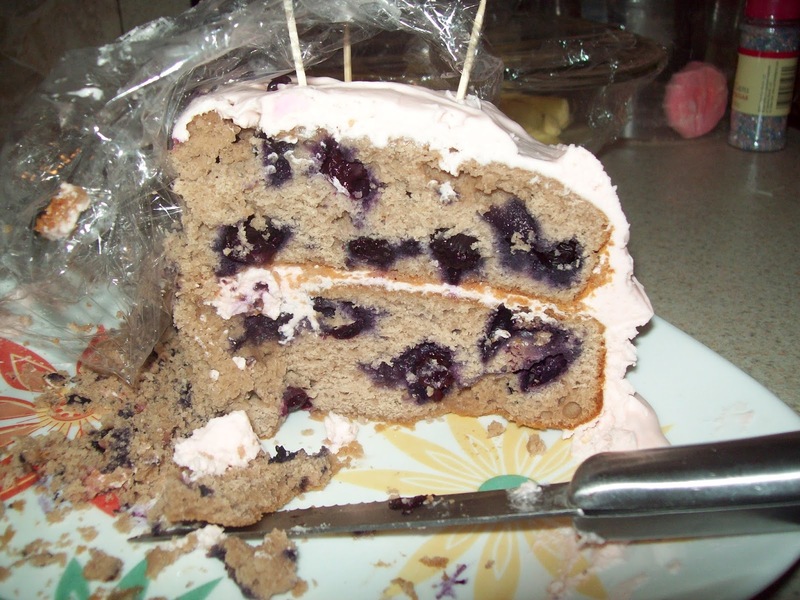 Mix in the blueberries gently with a spatula. 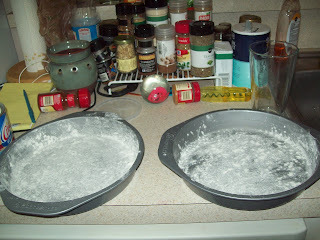 Divide the batter between the 2 cake pans. Bake for 30–35 minutes or until a toothpick inserted into the cake comes out clean. Let the cake completely cool before frosting. Beat the butter and cream cheese with a hand mixer until light and fluffy, about 3 minutes. Add the confectioner’s sugar slowly and fully incorporate. Add the vanilla and fully incorporate. 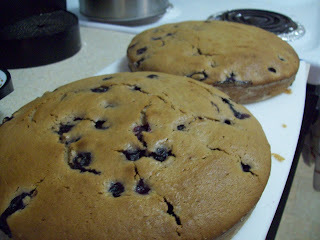 Cut the top of the cakes to level the tops. You want them to be as flat as possible. Place a dab of frosting in the center of the cake stand. Invert one of the cake pans onto the cake stand. This will help prevent the cake from sliding when you frost it. 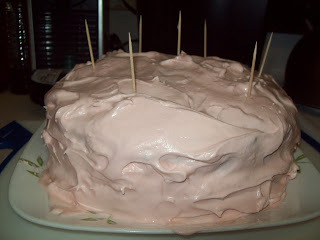 Use a little less than half of the frosting in between the layers. Place the other cake on top. Frost the entire cake as you wish! !